* Note that where this documentation refers to "SfB/Lync", it represents both Microsoft Skype for Business and Lync unless stated otherwise. Verify that a Virtual Meeting Room with the alias being dialed exists on the Management Node. Check if the Conferencing Node receiving the call is in maintenance mode. If the SfB/Lync client fails to connect to the conference altogether, we need to verify that the alias exists on the Management Node. After that has been verified, check if the Conferencing Node receives the SIP INVITE request from the SfB/Lync client. This can be done both on the Conferencing Node (with the support log) and on the FEP serving the SfB/Lync client (using the SfB/Lync debugging tools). After ICE negotiation has completed between the SfB/Lync client and the Conferencing Node, the SfB/Lync client should send a second INVITE to signal the ICE negotiation completion. If this second INVITE is not seen, this is a strong indication of a media connectivity issue between the two peers. If a Conferencing Node in a trusted application pool is placed into maintenance mode, and a SfB/Lync server sends a call to that node, the node will respond with 503 Service Unavailable and the call will then fail (SfB/Lync will not try another node in the pool). Therefore, if you need to place a Conferencing Node into maintenance mode, we recommend that you wait until all SfB/Lync calls on that node have completed, and then you should temporarily remove the node from the trusted application pool and then place it into maintenance mode. The node should then be returned to the trusted application pool after it has been taken back out of maintenance mode. Verify that the SfB/Lync client is correctly configured with an audio and video device. Verify that the call from the SfB/Lync client is placed as a video call rather than a SfB/Lync (audio-only) call. 200 OK response from Pexip Infinity should contain m=audio and m=video lines in SDP. Verify that firewall configuration permits relevant media traffic. Verify that SfB/Lync client receives RTP media from Pexip Infinity (using for instance Wireshark). Verify that Pexip Infinity Conferencing Node receives RTP media from SfB/Lync client (using for instance tcpdump). Note however that a different location may have been chosen at the time of installation. Select Start Logging and place a new call from the SfB/Lync client towards the Pexip Infinity conference alias. 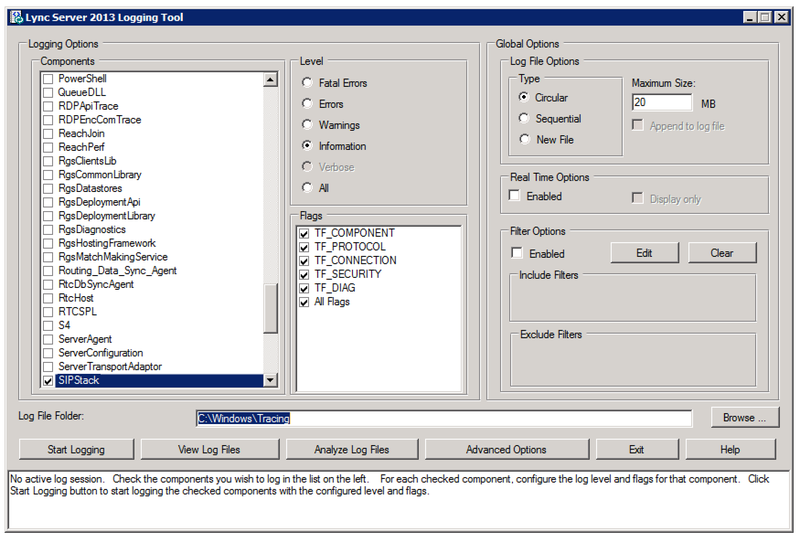 After the call has failed, select Stop Logging. Select View in the dialog which appears, and save the resulting text file in a suitable location. After a Pexip VMR has been merged with a SfB/Lync meeting, when viewing the conference status information for the VMR you may see one or more backplanes to the SfB/Lync server where there are no participants connected to that SfB/Lync node. One way in which this can occur is if a SfB/Lync client dials into a Pexip VMR, invites other SfB/Lync contacts into the meeting and then all of those participants disconnect. Whenever a SfB/Lync client that is dialed into a Pexip VMR adds a contact into the meeting, an adhoc SfB/Lync meeting is created and it is merged with the Pexip VMR. A backplane is established between the SfB/Lync meeting and the Pexip VMR. That backplane will continue to exist even if all of the participants in the SfB/Lync meeting disconnect. The backplane is only taken down when the Pexip VMR conference ends. Therefore if the SfB/Lync client and any other SfB/Lync contacts that had been in the adhoc SfB/Lync meeting all disconnect, you will continue to see the merged SfB/Lync meeting as a remote media node but with no participants connected to it. Note that the remote media node of a merged SfB/Lync meeting is identified by the address of the SfB/Lync client that initiated the SfB/Lync meeting. This can occur when the maximum inbound or outbound call bandwidth is too low. Ensure that the Maximum inbound call bandwidth and Maximum outbound call bandwidth advanced configuration settings for the Virtual Meeting Room or Virtual Auditorium is at least 1024 kbps. Updates to content being received by a SfB client via Pexip Infinity can in some cases be slow to load when viewed in "fit to window" mode. When the same content is viewed in "actual size" mode, the images are updated as expected. This occurs when content is being sent via RDP; content sent via Video-based Screen Sharing (VbSS) is not affected. To resolve this issue, ensure that VbSS is enabled on the Skype for Business server, and on Pexip Infinity (Platform configuration > Global settings > Enable VbSS for Skype for Business). If a SfB/Lync client initiates an IM session with a locked Pexip Infinity conference and attempts to send a message, it will appear to the SfB/Lync client as though the message has been successfully sent. However, other participants in the Pexip Infinity conference will not see the message. The SfB/Lync client will temporarily appear in the conference participant list but cannot be allowed in to the locked conference (as they are not currently sending any audio or video). SfB/Lync participants will not receive presentation content if Pexip Infinity is not configured to enable outbound calling to SfB/Lync clients. You must configure Pexip Infinity to enable outbound calls to SfB/Lync clients. This includes ensuring that every Conferencing Node is configured with a TLS server certificate that is trusted by the SfB/Lync server environment, and that every node has its unique SIP TLS FQDN setting configured. See Certificate creation and requirements for Skype for Business / Lync integrations for more information. Outbound video calls made from the Lync 2010 client for iOS may only connect using audio rather than automatically escalating to video as expected. This is currently the expected behavior with this type of Lync client. If a SfB/Lync participant in a SfB/Lync meeting is presenting while another device joins the SfB/Lync meeting via the Pexip Distributed Gateway, the SfB/Lync presenter will see a "Someone has joined and can't see what's being presented or shared" notification. However, the gateway participant will be able to see the presentation. The notification will disappear after approximately 15 seconds. If a standards-based endpoint transmits a dual stream presentation at a very low resolution, the transcoded presentation will be sent in native resolution to any connected SfB/Lync clients. This may create a sub-optimal experience depending on the PC screen resolution of the SfB/Lync end-user PC. If a Cisco VCS is used as call control between a Conferencing Node and a Lync 2013 FEP, only audio calls are possible. The FEP and the Conferencing Nodes should be neighbored directly and then audio and video calls will work as expected. Video from Lync 2010 or Lync for Mac clients will not be seen on endpoints connected via Pexip into SfB/Lync meetings. Video is not sent, in either direction, between RTV-based clients and a VTC system connected into a SfB/Lync meeting via Pexip Infinity. As a result, video from clients that only support RTV (such as Lync 2010 and Lync for Mac) will not be visible to those endpoints. However, clients such as Lync for iPhone, Android, Lync 2013 PC, Windows phone, Skype for Business 2015 and so on, all support video when connected via Pexip into SfB/Lync meetings. AVMCU calls support a maximum of G.722 (7 KHz audio), while Pexip Infinity supports up to AAC-LD (48 KHz audio). Under certain circumstances (for example, a meeting room with poor acoustics and many people speaking) there may be a perceptible difference in sound quality between an endpoint when using G.722 and the same endpoint when able to use a wider-band codec. The following table describes the typical problems and suggested resolutions for issues related to connecting to SfB/Lync meetings via the Virtual Reception (IVR gateway). After entering the Conference ID, the call tries to connect to the user that scheduled the meeting. The relevant Call Routing Rule does not have Match against full alias URI selected. Ensure that Match against full alias URI is selected. For more information, see Routing indirectly via a Virtual Reception (IVR gateway). The following table describes the typical problems and suggested resolutions for issues related to allowing devices to call SfB/Lync clients via the gateway. The SfB/Lync server returns a 400 Bad request response. The Call Routing Rule towards the SfB/Lync server has the wrong Call target type, such as Lync / Skype for Business meeting direct (Conference ID in dialed alias). Ensure that the Call target is set to Lync / Skype for Business clients, or meetings via a Virtual Reception. For more information, see Configuring rules to allow devices to call Skype for Business / Lync clients via the gateway. The following table describes the typical problems and suggested resolutions for issues related to gatewayed participants being disconnected from SfB/Lync meetings. Gatewayed participants are disconnected from SfB/Lync meetings. Participant history shows a disconnect reason of "CCCP call disconnected: Conference Terminated - Enterprise User Absent". All of the SfB/Lync clients have left the meeting and the gateway participants have been timed out. There is a SfB/Lync setting (AnonymousUserGracePeriod) that represents the amount of time an anonymous (unauthenticated) user, such as a gateway participant, can remain in a SfB/Lync meeting without an authenticated user being present in that same meeting. The default value is 90 minutes. For more information, see https://docs.microsoft.com/en-us/powershell/module/skype/Set-CsUserServicesConfiguration. Lync FEP and Conferencing Nodes should be neighbored directly then audio and video calls will work as expected. If participants that are connected to a Pexip VMR that is merged with a Skype for Business / Lync meeting, or that are in a gateway call, can't see shared content when a SfB/Lync user presents PowerPoint files, the most likely reason is that SIP TLS verification mode is On (Platform configuration > Global settings) and that Pexip Infinity does not trust the SfB/Lync Front End Server / FEP or Web Conferencing Edge device (it is always the Web Conferencing Edge for federated connections). If the server is not trusted, Pexip participants will not see any content. Level="ERROR" Name="support.ms_data_conf.ms_data_conf" Message="PSOM connection attempt 1 failed" Remote-address="lync-fep.example.local" Remote-port="8057" Error="SSL Alert" Reason-code="0x230" Alert-type="fatal" Alert-description="unknown CA"
To resolve this, ensure that the trusted CA certificate of the relevant Lync Front End Server / FEP or Web Conferencing Edge device is uploaded to the Management Node (Platform configuration > Trusted CA certificates). Depending on the size of the PowerPoint file, it can take a long time to display the presentation content to Pexip participants. This delay occurs while Pexip Infinity waits for the SfB/Lync server to make the presentation files (JPEG images) available. Level="INFO" Name="support.ms_data_conf.ms_data_conf" Message="Got download information for all PowerPoint JPEGs" Content-ID="1" Ppt-title="example.pptx" Download-URL-Base="https://webpool.infra.lync.com/DataCollabWeb/Fd/29f...J89/" Waited="118.913 seconds"
On rare occasions, some SfB/Lync users in a SfB/Lync meeting may occasionally experience dropped video frames from VTC endpoints that are gatewayed into that meeting. A mobile SfB client (iOS and Android), or SfB Mac client that is dialed into a Pexip Infinity VMR will never request anything higher than 360p. This means that although Pexip Infinity may receive a higher resolution video from the SfB client, it will only send up to a maximum of 640x360 to the SfB client (and limited to 180p to mobile and 360p to tablet devices).